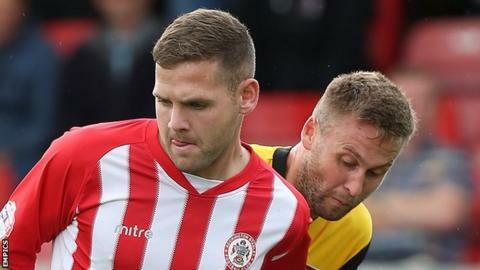 Accrington Stanley thrashed Crawley Town 3-0 to move up to fifth in League Two and extend their unbeaten run to seven games. Josh Windass scored from the spot after Luke Rooney's foul saw him sent off and Matty Crooks smashed home from 25 yards to put Stanley 2-0 up at half-time. Billy Kee's close-range shot sealed the points for the visitors. Crawley, who have now lost their last four, went closest through Jon Ashton's weak shot in the early stages. "After 40 minutes I was thinking 'it's not been bad'. We then concede and have a man sent off and a couple of minutes later another one goes in and it's completely different. "The players are little low on confidence and I think you can all see that when their lad goes down the byline, we had three men around him and still gets the ball in. "We are trying to get them at it all the time and get their heads up. The third goal sums us up and we let a runner go." Match ends, Crawley Town 0, Accrington Stanley 3. Second Half ends, Crawley Town 0, Accrington Stanley 3. Attempt blocked. Lee Barnard (Crawley Town) right footed shot from the centre of the box is blocked. Corner, Crawley Town. Conceded by Billy Kee. Goal! Crawley Town 0, Accrington Stanley 3. Billy Kee (Accrington Stanley) right footed shot from the centre of the box to the bottom right corner. Assisted by Sean McConville. Attempt saved. Billy Kee (Accrington Stanley) right footed shot from the right side of the box is saved in the centre of the goal. Adam Buxton (Accrington Stanley) wins a free kick on the right wing. Lewis Young (Crawley Town) wins a free kick on the left wing. Joe Wright (Accrington Stanley) wins a free kick in the attacking half. Foul by Josh Windass (Accrington Stanley). Attempt blocked. Adam Buxton (Accrington Stanley) right footed shot from outside the box is blocked. Liam Wakefield (Accrington Stanley) wins a free kick in the attacking half. Foul by Ross Jenkins (Crawley Town). Foul by Liam Wakefield (Accrington Stanley). Josh Windass (Accrington Stanley) wins a free kick on the right wing. Substitution, Crawley Town. Shamir Fenelon replaces Matt Harrold. Substitution, Crawley Town. Lee Barnard replaces Rhys Murphy. Seamus Conneely (Accrington Stanley) is shown the yellow card for a bad foul. Ross Jenkins (Crawley Town) wins a free kick in the defensive half. Attempt missed. Adam Buxton (Accrington Stanley) right footed shot from outside the box misses to the left from a direct free kick. Adam Buxton (Accrington Stanley) wins a free kick in the attacking half. Attempt missed. Piero Mingoia (Accrington Stanley) left footed shot from the centre of the box is close, but misses the top left corner.